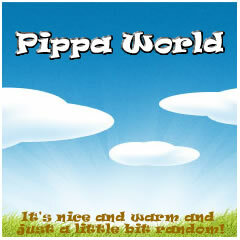 Pippa World: I'm not depressed! I realised a lot of my blog posts make me seemed a bit depressed, which isn't the case, it's just that the random thoughts I've been letting out have been the depressing ones. I guess if I didn't let them out then I might be depressed but inside my head it is still warm and nice and random. I'm still thinking about rainbows and puppies and zoning out in Church. I'm still thinking about cakes and icing and how to change car light bulbs. I'm still thinking about the ironing, firing a gun and listening to the voices in my head. I'm still thinking about Candy Crush and the best way to shave a cat should I ever have to and what I would do if trapped in a room with no internet. So I promise that my next few blog posts will be much more positive and smiley, or my name isn't Dan Jon Jr.
Are you sure that Rollie wouldn't like a reverse mohawk? !